Safety is of the utmost importance when transporting horses. If you are a first-time driver, practice driving the combination before you ever put a horse in it. Backing a trailer can seem intimidating, but it really isn't too hard if you know the secret. Put your hand on the bottom of the steering wheel and turn it in the direction you want the back of the trailer to go. If you want the trailer to move sharply, turn the wheel before you move the vehicle. If you want to turn more gradually, turn the wheel as the vehicle is moving. This works for either a gooseneck or a tag-a-long trailer. A tag-a-long with a long tongue is easier to back than a trailer with a short tongue. A tag-a-long trailer that has a dressing room is also easier to back than a trailer without one. If you are only hauling one horse, put him on the driver's side. If you are hauling more than one horse, put the heavier one on the driver's side. Roads are usually crowned higher in the middle so putting the heavier load on this side will help balance the trailer. If you have a friend with you, and you really should not haul alone, familiarize him/her with your rig. If you should become incapacitated, for some reason, your friend may have to take over. Before you leave for a trip, take the time to check over the rig. Check and replenish engine fluid levels and wiper fluid. Towing puts extra stress on the radiator, brakes, and transmission, so make sure everything if in top working order. Check tire pressure in the tires on the tow vehicle and the trailer. Improper tire pressure is one of the most common reasons for trailer sway. Check lug nuts on the wheels. Wheel nuts and bolts should be torqued before first road use on a new trailer and after each wheel removal. Check and retorque after the first 10 miles, 25 miles, and again at 50 miles. Check the inside of the trailer for bees and wasp nests. Check over your hitch, coupler, breakaway brake battery, and safety chains. Make sure all lights and the brakes are working properly before you load the horses. When the horses are loaded make sure all doors are latched properly, and horses are tied. Drive down the driveway and before you drive onto the road, get out and check your hitch assembly again. Take a look at the horses too, to make sure they're good to go. If you happen to stop somewhere where the rig has been left unattended, check everything all over again. Someone may have been tampering with the trailer or the horses. Driving a horse trailer requires some special precautions. The extra weight will make stopping and starting distances longer, and you will not be able to accelerate as quickly as if you did not have the trailer, especially if you have a downsized vehicle. So drive at least 5 miles under the speed limit and stay a good distance from the vehicle in front of you. Change lanes gradually and always use your turn signals. Use a lower gear when traveling up or down steep grades. On long grades, downshift the transmission and slow to 45 mph or less to reduce the possibility of overheating. Always consider the horses in the trailer. Give them time to prepare for stops. Don't accelerate quickly, and make sure the trailer has cleared the turn, straightened out, and the horses have regained their balance before you return to normal speed. Travel over bumpy roads carefully. If you hear or feel anything that isn't normal, stop and check it out. Carry an automobile emergency kit with you and an emergency kit for the horses. A human emergency first-aid kit is also a good idea. Carry a cell phone or CB. There is an emergency road service available called US Rider for people who are hauling horses. A membership can give you some peace of mind. Remember that if you have an accident, and you become incapacitated for one reason or another, the emergency personnel and police will most likely not have a clue how to handle your horses. In a visible place in your tow vehicle and/or trailer, put a list of emergency numbers for them to call - your veterinarian, friends, or family members who would be able to help make decisions about your horses. Whether you are traveling one mile or 500 miles, once you leave your driveway you are at risk. By taking these precautions you have increased your chances to have a safe and enjoyable trip with your horse. 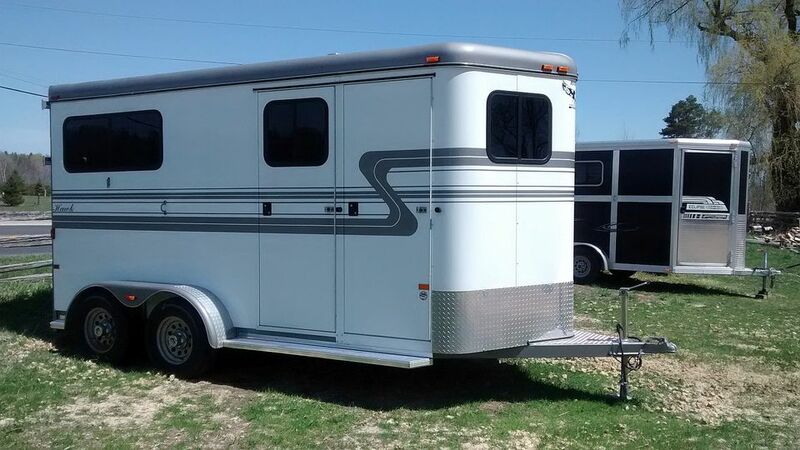 Neva Scheve is a recognized authority on horse trailer safety and author of, "The Complete Guide to Buying, Maintaining, and Servicing a Horse Trailer." You can learn more about trailer safety at EquiSpirit Horse Trailers.